Looking for an exceptional outdoor knife but prefer folders? Look no further. 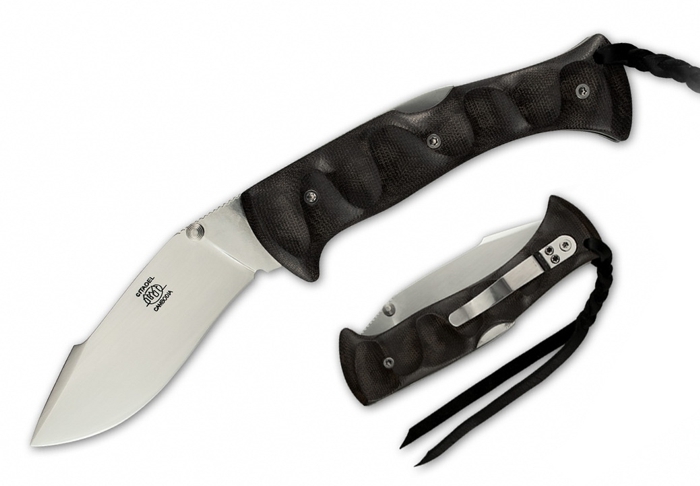 Citadel's Phobos lock-back folder is a true wilderness companion. Using all modern materials (N690Co stainless blade, Z40C13 stainless scales & lock, micarta handle scales) the Phobos is a break from most of Citadel's knives while retaining everything that makes them so special. The N690Co stainless steel blade is sharpened to a full convex edge providing long-term edge retention. Hollowed-out micarta scales have a unique design that provides a ton of grip without fatiguing the hand. The blade shape is kukri-esque and lends itself to just about any task you can throw at it. The back-lock and spring are strong, much stronger than a liner lock and give a quite satisfying thunk when the blade is opened. A stainless pocket clip is included. A nylon canvas pouch with embroidered Citadel logo is included. CAS Iberia is the leading wholesale provider of affordable, high quality swords, knives and reenactment gear catering to a vast array of enthusiasts, collectors, outdoorsman and martial arts practitioners that demand more from their equipment. Working hand in hand with our suppliers puts us on the cutting edge of design and manufacturing, often imitated but never duplicated. We began as an importer of quality knives from Spain over 30 years ago and have since grown into one of the largest wholesale distributors of quality swords, knives, reenactment, sparring and fantasy gear in North America, Australia and beyond. The relationship with Hanwei & Paul Chen began in 1998 with the release of the original Shinto Katana, thus revolutionizing the quality of katana available to sword enthusiasts outside of a true Japanese made Nihonto. Over the years Hanwei and Paul Chen’s name have become synonymous with high quality swords. In late 2011 we began our relationship with Red Dragon Armory, a small group of dedicated makers based in the UK that have developed in conjunction with Dave Rawlings an excellent set of high impact polymer training swords for the HEMA market. In 2013 we also partnered with Kizlyar Supreme, a knife manufacturer from Russia, to offer a wide range of high end hunting, tactical, and folding knives. Continuing the tradition of offering the highest quality options to collectors we announced in the summer of 2014 a collaboration with Citadel Knives and Swords of Cambodiato produce a line of high-end limited edition samurai swords. Citadel is a low-volume maker hand crafting each component of their knives and swords. Spring of 2015 saw the announcement of the availability of Citadel’s handmade knives to our line. These knives are unique in offering premium modern steels with high end natural materials for the handles. After nearly 2 years of design and development work, we were proud to bring the first swords from Frenchie Jin’s Dragon King Forge to North America in late 2015. Dragon King combines exceptional casting and design work with highly functional forged steel blades to make remarkable swords. In early 2016 we introduced the first swords under the all new Kingston Arms brand of swords. Kingston Arms was conceived as a premium line of historical, stage, reenactment and HEMA swords and accessories for the discerning European sword enthusiast. Kingston Arms will also host our first US made swords, brought to life by famed medieval sword maker Angus “Gus” Trim. At Blade Show 2016 we announced our partnerships with two more knife brands, one old and one new. Casstrom of Swedenis a relative newcomer to the buschraft and outdoor knife market putting out innovative designs with traditional roots. Okapi has been making knives for the African market for 102 years, made in South Africa these affordable and unique knives and tools are highly functional and a great value.